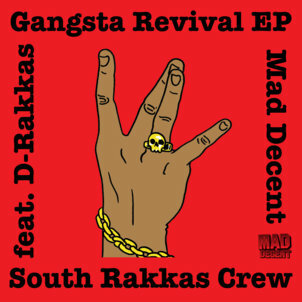 Maddecent leaked three Remixes of the title track from the forthcoming “Gangsta Revival” EP by South Rakkas Crew! Grab a free Dubstep Remix by Tigerstyle, a Moombahton Remix by JWLS and a Electro Remix by RackNRuin from maddecent’s soundcloud! They won’t be featured on the EP itself, which drops on Tuesday. If you want to prelisten all 8 tunes from the EP you can do that by visiting maddecent (here)! Here is the fourth and the last free Gangsta Revival Remix, a Electronic Version by The Elementz, released yesterday! Don’t forget: The Ep is out, now!